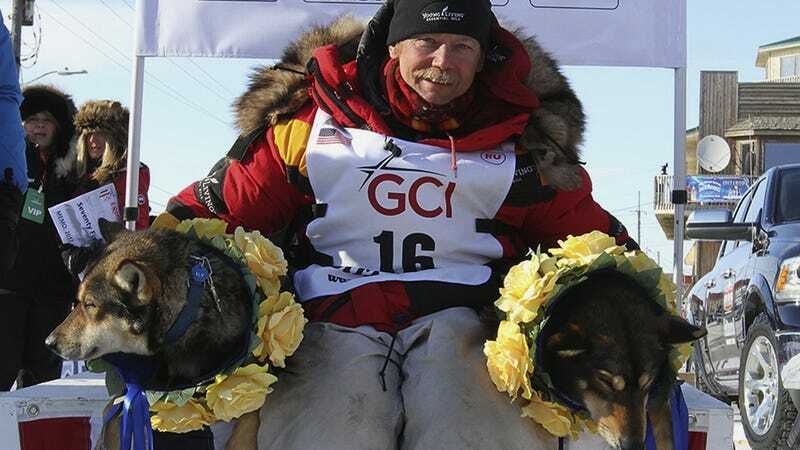 Fifty-seven-year-old Mitch Seavey became the oldest and fastest musher to win the Iditarod Trail Sled Dog Race when he pulled into Nome, Alaska, yesterday. It was Seavey’s third win in 13 races and his runtime of eight days, three hours, 40 minutes, and 13 seconds unseated his son, Dallas both as reigning champion and Iditarod record-holder. Dallas Seavey came in second, finishing nearly three hours behind his father, and both Seaveys completed the race in a shorter time than Dallas’a then-record 2016 time of eight days, 11 hours, 20 minutes, and 16 seconds. The dogs aren’t doping this year (that we know of) but the new record might still merit an asterisk since the race followed a different course than it usually does. A warmer winter meant the start of the race was moved north from Willow Lake to Fairbanks in search of snow, shifting the route largely out of the the Alaska Range, which probably made the going a little easier. It’s the second time in three years that the starting line was moved, but only the third time in the Iditarod’s 45-year history. In 1973, another Seavy, Mitch’s father Dan, finished third in the first-ever Iditarod with a run time of 20 days, 14 hours, 35 minutes and 16 seconds. Over the 1,000-mile course, Seavy and his team of 11 dogs averaged 10-11 mph, running through temperatures that dipped as low as negative 50 degrees. Seavey rested his dogs on the sled in shifts throughout the race, which he said contributed to their pace. Seavey’s victory marks the winding down of an Iditarod that has been marred by four dog deaths—as many as in the previous four races combined.